There is still "underlying strength" in the Sydney market, says Chris Wilkins of Ray White Drummoyne. Sydney's beautiful Bondi to Bronte coastal walk. It is a "significant turn of events" to see Sydney prices listed alongside Perth and Darwin's, writes CoreLogic head of research, Tim Lawless, of the latest monthly price data. 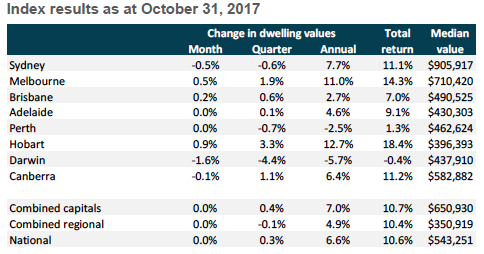 Sydney property prices fell 0.5 per cent in October, and are down 0.6 per cent for the quarter. Perth prices were down 0.7 per cent in the three months to the end of October, and Darwin prices slipped 4.4 per cent for the quarter. Chris Wilkins, agent with Ray White Drummoyne, told SCHWARTZWILLIAMS there is still "underlying strength" in the Sydney market. He said that negative data can be a self-fulfilling prophecy. He said four properties were withdrawn from auction last week because the agents and vendors believed the market is flattening. But Wilkins said he had three auctions last night with strong buying interest. One auction had five bidders, and all three properties sold for good prices. Wilkins said properties have to be priced for the current market conditions. When all the "ingredients" are right, said Wilkins, the market was still good. But he admittted that when the ingredients aren't there, the market is "carnage". Melbourne and Hobart prices continues to post gains, though at a slower pace than in recent months, with investors drawn to the cities' more affordable homes. Hobart's property prices grew the most strongly in the country, rising 0.9 per cent in October, while Melbourne's property prices rose 0.5 per cent. Hobart has recorded the strongest gains for the year, with prices up 12.7 per cent, while Melbourne is in a close second place, with gains of 11.0 per cent. Lawless attributes Melbourne's gains to Victoria's record-breaking immigration rate and more affordable homes. Hobart's affordability is making the city more desirable for interstate investors, he said. "Hobart is benefitting form renewed housing demand in the form of interstate migration," he said. The slowdown in price growth follow's APRA's crackdown on lending, placing a 10 per cent limit on loans to investors, and a 30 per cent cap on lending for interest only loans. "Since moving through a peak rate of growth in November 2016, capital gains across Australia's housing market have been losing momentum," the CoreLogic data release states. Lawless said, "The slowdown in the pace of capital gains can be attributed primarily to tighter credit policies which have fundamentally changed the landscape for borrowers." "The peak rate of growth in dwelling values lines up closely with the peak growth rate for investment lending in late 2016," he said. Across the nation, prices were flat, but still recorded a 6.6 per cent annual gain. Prices in both the nation's cities and regions were flat, although capital cities recorded stronger annual gains at 7.0 per cent than regional Australia's annual gains of 4.9 per cent. View Chris Wilkins's profile on Luxury List. View the Luxury List profile for Ray White Drummoyne.